Does Your Multivitamin Provide Nutrients That Boost Natural Killer Cell Activity To Optimize Your Immune System? Grow old, wait for your immune system to decline, develop pneumonia, cancer and all manner of viral infections, then let modern medicine step in and rescue you from life-threatening health problems. With that in mind, modern medicine is ramping up efforts to utilize a subset of white blood cells known as natural killer (NK) cells primarily to kill cancer cells. 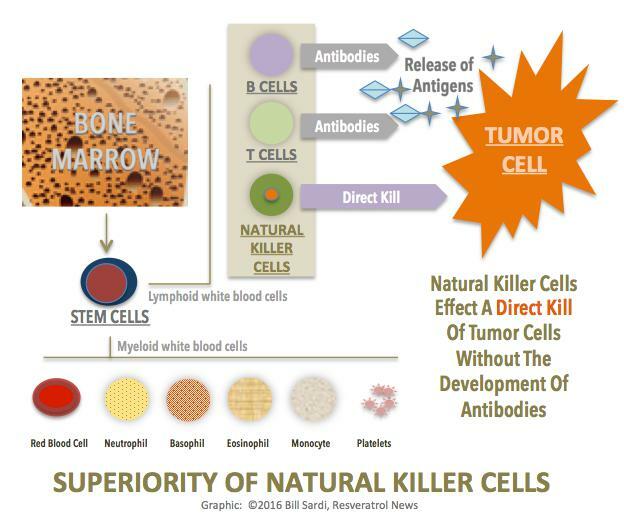 Natural killer cells release a toxic chemical called interferon to destroy tumor cells. 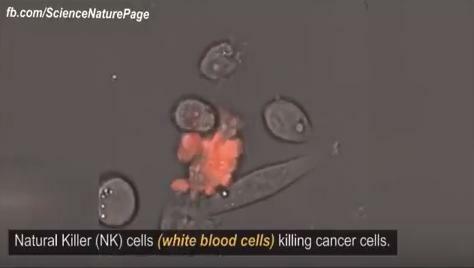 Readers of this report can view an online video of natural killer cells destroying tumor cells by clicking on the graphic below. Sadly, NK cell therapy is only going to be used to treat diagnosed cancer rather than restore natural killer cell activity to maintain health before cancer has a chance to get started. Natural killer cells represent the first line of immune defense against malignant cells. Originating from bone marrow, natural killer cells comprise about 15% of all circulating white blood cells (aka lymphocytes). Why focus on natural killer (NK) cells when there are also other important white blood cells such as neutrophils, macrophages and T-cells (thymus cells)? Because natural killer cells directly destroy invading viruses and malignant cells rather than rely on antibody production such as with anti-cancer vaccines. The next frontier in cancer immunotherapy is natural killer (NK) cell therapy. Researchers now say the emerging field of nutritional immunology should focus on natural killer cells for both cancer prevention and treatment. NK cells bind to and kill cancer cells without side effects associated with T-cell-based treatments that are now curing blood cancers (leukemia). Immunotherapy is about to supplant chemotherapy that harms healthy cells as well as malignant cells and can often lead to the early demise of cancer patients before their tumors induce death. But again, why wait for cancer to occur before an army of natural killer cells your body naturally produces is mobilized to maintain health? The ability of malignant cells to escape destruction by the immune system is a major problem that impairs even the most advanced forms of immunotherapy now under rapid development by pharmaceutical and biotech companies. CAR-T cell therapy used to cure blood cancer (leukemia) is not foolproof. And it costs hundreds of thousands of dollars. An expert in cancer therapy says natural killer cell therapy would be far more economical and would not rely on antibody production to abolish tumor cells. Dr. Carl June of the University of Pennsylvania says: “just one engineered natural killer cell can proliferate and defeat a cancer.” As evidence Dr. June points to a successful case where a patient was infused with many genetically engineered immune cells. One of those cells replicated more than all others, and its descendants eradicated 5 pounds of tumor cells! Yet again, why allow natural killer cells levels and activity to decline with advancing age and then treat cancer? Cancer researchers are saying they can create cancer therapies based around natural killer cells that could as effective as CAR-T therapies, but at around one hundredth of the cost. Some drugs aim to stimulate the body’s natural killer cells to fight cancer – but this leaves the door open for cancer patients to do this on their own using natural molecules to promote health rather than treat disease. A well-designed multivitamin should help maintain healthy levels of natural killer cells in your body as you age. Nutrients such as rice bran IP6, resveratrol, quercetin and zinc boost NK cells. These nutrients can be employed to control minerals like iron and copper that accumulate in the human body with advancing age and diminish the number and activity of natural killer cells. As men cease growing, ~age 18, or when women cease menstruating, is when metallic minerals such as iron and copper begin to accumulate. By age 40 men have twice the amount of stored iron in their body and experience double the rate of cancer compared to a menstruating 40 year-old woman. What researchers have discovered is that increased iron levels inside and surrounding cancer cells impairs the ability of natural killer cells to attack and induce cancer cell death. Researchers find higher levels of the iron-storage protein ferritin accelerates tumor cell growth. Excessive intracellular iron leads to the propagation of cancer stem cells whereas iron chelators (key-lay-tors) that bind up iron do the opposite and are posed as effective treatment against cancer. It is not surprising to learn that individuals who are iron-overloaded (hemochromatosis) exhibit a reduced number of NK cells. Abnormal blood-forming cells within the bone marrow may result in cancer of the blood (leukemia). Iron overload within bone marrow has been shown to reduce the number of natural killer cells. When iron supplements are provided to women they dramatically experience a reduced number of natural killer cells, which correlates with elevated iron storage (ferritin). The normal range for ferritin is 20-70. Iron depletion also reduces the incidence of tumors by mechanisms other than natural killer cell activity. While iron deficiency can impair the ability of natural killer cells to destroy tumor cells, excess iron appears to be far more prominent than iron deficiency at inducing cancer. A component of rice bran known as IP6 (inositol hexaphosphate) is nature’s master iron chelator. When laboratory animals are injected with a cancer-causing chemical to induce colon cancer, with some of the animals having the iron-chelator IP6 (inositol hexaphosphate) added to their diet, natural killer cell activity rose in the IP6-supplemented group, which reduced tumor numbers and size. The percent of natural killer cells was 15.7% in the normal-fed group and 42.2% in the IP6-fed group. The red wine molecule resveratrol (rez-vair-a-trol) is another natural killer cell booster. Resveratrol strongly elevates natural killer cell numbers and activity. Quercetin, another red wine molecule, has also been shown to improve natural killer cell immunotherapy. One of the problems encountered in attempting to utilize natural killer cells to kill cancer cells is that the malignant cells are surrounded by blood platelets (clotting factors) that protect them from the natural killer cells. Resveratrol, by virtue of its ability to completely inhibit the aggregation of blood platelets, is able to increase the cancer-cell killing effect of NK cells. Be aware, more resveratrol is not necessarily better. Excessively high doses of resveratrol may inhibit the ability of natural killer cells to attack cancer cells whereas lower doses decisively elevate natural killer cell activity. Zinc is another iron-controller and NK cell booster. With advanced ageing the zinc levels in the body undergo progressive reduction. Low zinc levels are associated with diminished natural killer cells activity. Zinc supplementation restores full natural killer cell activity. When blood samples of older adults are obtained, they exhibit fewer and less active natural killer cells. Supplementation with zinc in a lab dish greatly increases the number of NK cells in blood samples from both young and old adults. Zinc deficiency is highly prevalent among cancer patients. Zinc interacts with iron and the greater the concentration of zinc the less iron and the greater natural killer cell activity. Thus zinc works to balance iron levels. Zinc deficiency reduces natural killer cell activity. More than 10 milligrams of supplemental zinc has been found to increase natural killer cells and strengthen the immune system against cancer. The world’s leading authority on zinc, Ananda S. Prasad, PhD, says up to 30 milligrams of zinc can be taken safely every day without inducing an imbalance with copper. Both vitamin C (1000 mg) and zinc (30 mg) are documented to increase natural killer cell activity. Deficiencies in zinc and vitamins A and D may also reduce natural killer cell function, whereas supplemental zinc or vitamin C may enhance their activity. Boost your natural killer cell activity by using a daily multivitamin like MOLECULAR MULTI that provides IP6, resveratrol, quercetin and ample amounts of zinc.